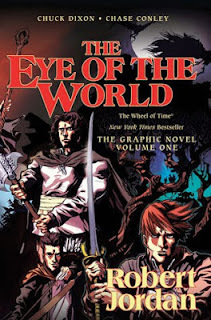 Having struggled a bit through The Wheel of Time, but overall leaving the series feeling positive on a whole, I figured a good endcap would be trying out the graphic novel adaptation of The Eye of the World, which only covers the first section of the novel. The good is that it does what Jordan was incapable of doing - it boils the story down to (for the most part) its important essences. The story feels a lot more concise and the point of what's going on comes about a lot clearer. With that said, it's effectively eight issues that probably could have been shrunken a bit, but it's simply a difference between what I found important and what Chuck Dixon, who adapted the book. The bad is that the artwork is much more manga-esque than I expected, and looks less like paper art and more like something devised up on a computer. I'm hardly an art purist, nor do I pretend to know much of anything about art, but expecting a graphic novel and getting something different was continually jarring. Seeing Rand in particular with hair that looked straight out of an anime in some scenes was a bit different for me. Overall, the book is far from a failure. It does a good job with the source material, and clearly people are enjoying it so far. At this point, it's not so much that it's not good, but more simply that it's just not for me.